This topic was published by DevynCJohnson and viewed 972 times since " September 30, 2015 @ 14:36UTC ". The last page revision was " March 25, 2016 @ 14:36EDT ". Linux-Toolbox is an open-source program (GNU General Public License v3) made by Devyn Collier Johnson. The program was first released in August 2014 as closed-source proprietary software. However, the program is now open-source and freely available. Linux-Toolbox is licensed under the GNU General Public License v3 (http://www.gnu.org/licenses/gpl-3.0.txt). The program is written in Python3 and is a single plain-text script. 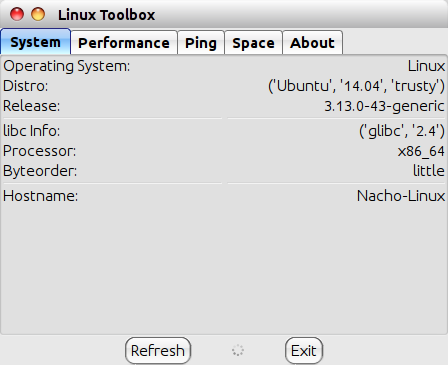 Linux-Toolbox lists information about the system in a GTK3-based window. 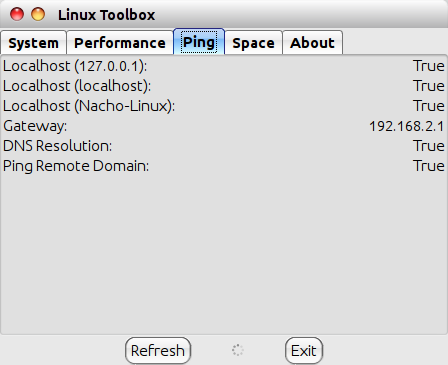 The program can also be used to diagnose the source of network issues by using the "Ping" tab. The "Ping" tab lists IP addresses that were pinged and if the ping was successful or not.